I recently received the most amazingly fragrant organic roses from Bumblebee Flower Farm in West Cork. The scent was something that you would never get from a standard shop-bought rose…these roses were those that you just wish to close your eyes and breathe for. My purpose was to try out some of the beautiful summer blooms from Bumblebee Farm for use as decoration in some of my cake designs, but I couldn’t pass the smell of these roses without thinking that I had to incorporate that scent into a cake too! 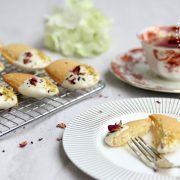 Madeleines are small French butter cakes baked in pretty scalloped-shaped madeleine moulds. 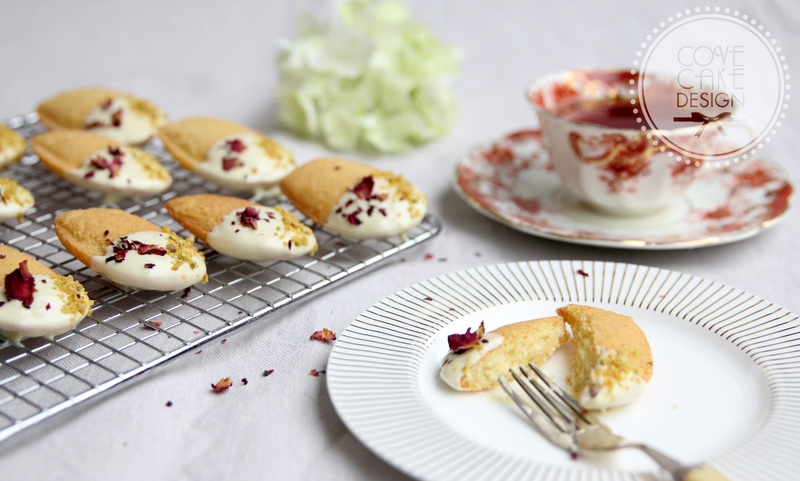 I had only made them once before but thought that making a delicate rose-scented version would be perfect for these dainty teatime treats. To capture the scent of the rose petals, I infused the butter in the recipe first which resulted in a deliciously subtle sweet and fragrant flavour. 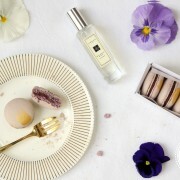 If you can’t get your hands on rose petals feel free of course to add a little rosewater for a similar taste. This base recipe would also work with other flowers such as lavender. Normally my recipes are self-explanatory but much like other French baked goods (macarons spring immediately to mind! ), I have found that making madeleines is not quite as straightforward as it seems and a few little tricks are essential! In my first attempt at this recipe I only buttered the tin, resulting in cakes that stuck tight. A dust of flour is essential. Recipes vary greatly and I initially didn’t chill my batter but they subsequently rose and spread hugely outside the moulds, tasting delicious but losing their pretty shape. I found chilling the batter in the tin for about 30 mins solved this. I have also found that the light sponge doesn’t stay fresh for long, so feel no guilt in devouring these tiny treats on the day they are made! Step 1: To make the rose butter madeleines, preheat the oven to 170°C/315F. Step 2: Melt the butter in a small saucepan over a low heat. Add the rose petals and leave to infuse, swirling now and then. The butter should become fragrant with the rose petals. Have a small taste to check and if not leave for a little longer or add more petals. Step 3: Use a little of the butter to brush over the moulds of a madeleine tin. Then dust the moulds with a little flour, tapping out any excess. Step 4: Whisk together the egg and caster sugar using a handheld or stand whisk until the mixture is pale and mousse like and has increased in volume. Step 6: Strain the butter into the mixture, discarding the rose petals, and fold in gently until combined. Step 7: Place a heaped teaspoon of the mixture into each of the moulds of the madeleine tray and place in the fridge for 30 mins. Step 8: To make the pistachio praline, roughly chop the pistachios and place a square of baking paper on a tray. Step 9: Heat the sugar in a small saucepan over a medium heat, swirling regularly until dissolved. Step 10: Continue to heat the sugar until it caramelises, taking care not to burn. Step 11: Remove from the heat, add the chopped pistachios and quickly stir to coat in the caramel. Pour out onto the baking parchment and leave to cool. Step 12: Place the praline in a chopper or pestle and mortar and grind to a rough consistency. Step 13: To finish the madeleines, remove the madeleine tray from the fridge and bake for approximately 12-15 mins until risen and springy to the touch. Remove from the oven and leave to cool for a few minutes before gently removing each madeleine from its mould using a palette knife. Leave to cool on a wire wrack. Step 14; Melt the white chocolate in a cup or small bowl in the microwave. 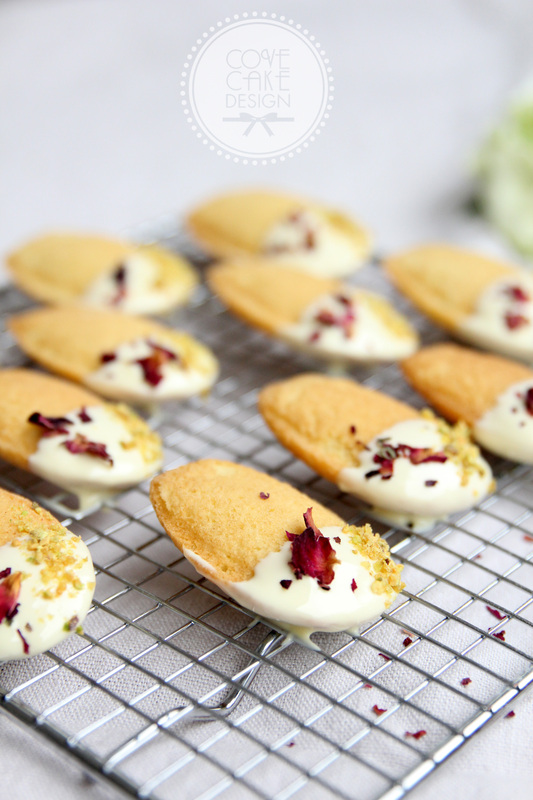 Dip the tip of each madeleine in the white chocolate and place on a sheet of baking paper. Sprinkle some pistachio praline and rose petals over the top. Enjoy immediately! I recently came across dried Hibiscus flowers on one of my many compulsive deli wanderings. Ruby red in colour, it is consumed as a tea, with a tart berry-like flavour, often requiring the addition of sugar to counteract this. I love using teas to flavour cakes and decided to try Hibiscus in a loaf cake, paired with the classic combination of lemon and raspberry. This cake recipe is deliciously moist due to the addition of natural yogurt, and the hibiscus flavour is introduced as a drizzle syrup, and in a tangy cream cheese icing. I decorated with candied hibiscus flowers, pistachio praline crumb (I do like to add pistcachio to all things possible!) and thyme flowers, but would be equally as good just with a smattering of fresh raspberries. Enjoy with a cup of your favourite brew! (Note: If hibiscus flowers are hard to find this recipe is delicious as a simple lemon raspberry loaf cake. Simply substitute lemon juice for the hibiscus water in the syrup and omit the hibiscus syrup in the icing. Or ice with a simple mix of icing sugar and lemon juice!). Other options include fresh raspberries, candied lemon peel and edible flowers! Step 1: To make the lemon raspberry cake, preheat the oven to 170°C/315F. Grease and line a loaf tin. Step 2: Cream together the butter, sugar and lemon zest with an electric mixer (or hand mixer) until pale. Scrape down sides regularly. Step 3: Beat in the eggs one at a time. Step 4: Sift together the flour and baking powder into a large bowl. Step 5: Add the flour to the butter and sugar mixture and mix on slow speed until just combined. Step 6: Add the natural yogurt and mix again until combined. Step 7: Pour the batter into the lined tin. Push the raspberries about half way down into the cake so they are dispersed throughout the loaf. Smooth over the top and bake in the preheated oven for approximately 50 mins or until the top is springy to the touch and a skewer inserted into the centre comes out clean. Step 8: To make the hibiscus syrup, add the hibiscus flowers to the boiling water and leave to steep for 10-15 mins. Step 9: Drain the hibiscus water into a small saucepan and add the sugar. Heat until the sugar is dissolved and a syrup formed. Step 10: To make the hibiscus cream cheese icing, mix together the cream cheese, yogurt and lemon zest until combined. Add the hibiscus syrup a little at a time until the desired consistency and taste is achieved (you don’t want it to be too runny). Step 11: To assemble the cake. When the cake is cooked remove from the oven and leave to cool in the tin for 10mins before turning out onto a wire wrack to cool further. Step 12: While the cake is still warm, poke holes in the top with a skewer and pour the warm hibiscus syrup over the top. Step 13: When the cake has cooled completely, cover with the icing and decorate as you see fit! I used candied hibiscus flowers, pistachio praline crumb and thyme flowers. Some fresh raspberries would work equally well! Storage: Due to the cream cheese icing this cake needs to be stored in the fridge. Bring to room temperature before serving and consume within 1-2 days. Instagram has to be the one social media outlet that I truly love. More than a social media channel or advertising domain, it can be a source of unending inspiration. 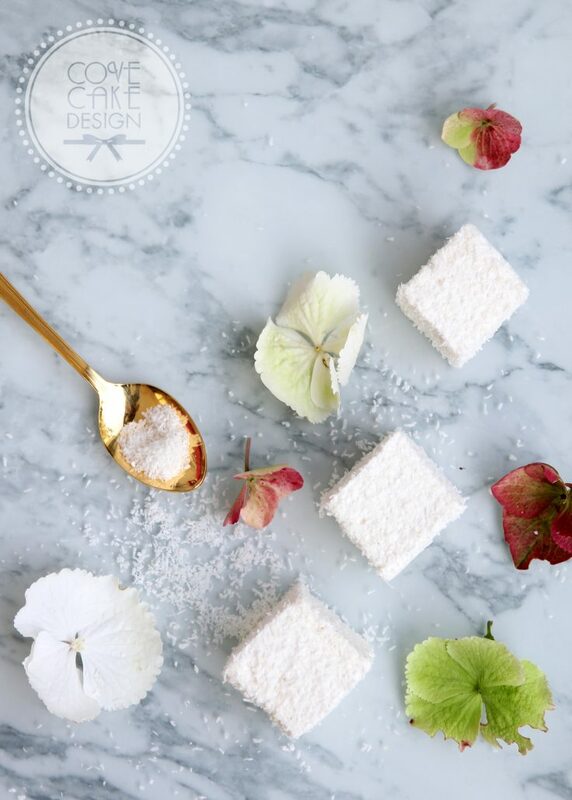 From recipe writers to artists, food stylists to interior designers, not to mention fellow cake makers, I love to see beautiful imagery popping up in my feed. Today I thought I would share a few of my favourites with less than 5,000 followers. I only recently stumbled across the feed of Natasja Sadi (@cakeatelieramsterdam), a wedding dress designer turned cake decorator. Her Instagram feed is filled with beautiful images of her stunning lifelike sugar flowers, artistic cakes as well as little glimpses of her carefully curated interior style. Add to this pretty photos of one of my favourite cities, Amsterdam, and Natasja’s Instagram feed is a firm favourite! 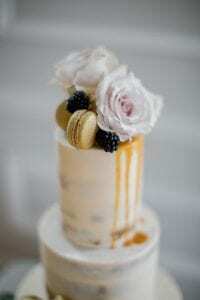 @pippa_cakery, based in Utah, is run by Tauri Tucker. 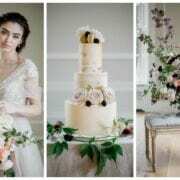 Her Instagram feed showcases her seemingly effortlessly styled cakes, which are characterised by decadent touches such as caramel drips, gold leaf and fresh flowers. Most importantly however is how delicious they look..sure to spark a cake craving! 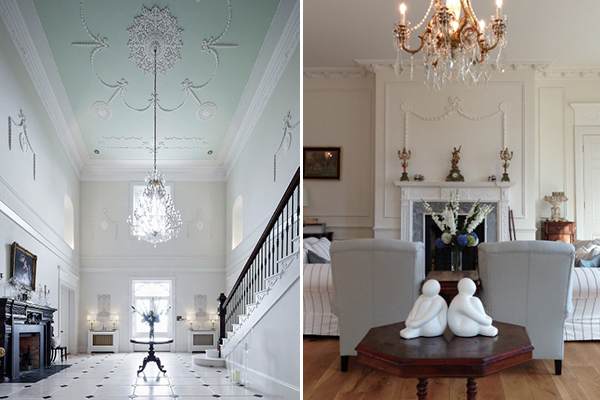 Designology is an inspirational interiors and lifestyle blog by Moya Farrell. Her Instagram feed @designology.ie is a carefully curated collection of casually styled interiors, delicious food and everyday beauty…all in a serene and pretty colour palette…sure to calm and inspire, it is always a delight to see her photography in my feed ! Marcy Lamont of Cotton & Cream Studio makes THE cutest cake toppers! With the most intricate of details they always elicit an ‘aww how cute’ from both myself and my children when I show her images to them. A peek through her Instagram feed is sure to bring a smile to anyone’s face! @cavistons is my amazing family-run local delicatessen. Providing me with much of my fresh fruit as well as more unusual ingredients for my cakes and recipe experiments, no matter how often I visit I always love to browse the heavily stocked shelves of artisan produce. But their Instagram feed is also worth more than a mere mention…with beautifully styled deli products and ingredients, as well as tips and recipes on how to use them, I always love to see their imagery pop up in my feed! I adore Asian food and flavours, having visited various parts of the region over the last 10 years while my husband worked there. So I was thrilled to be asked to create custom flavours with a nod to Asia for a Chinese New Year event that took place here this week. The clients requested an assortment of macarons as well as a small dessert-style sweet to include flavours of lychee, green tea, rose and raspberry. The colour palette for the event was one of red, gold, green and deep pinks. For the dessert option we made white chocolate mud cake bites, with green tea buttercream, toasted black sesame, raspberry curd and rose meringue kisses. 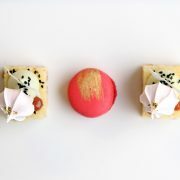 The macaron flavours were Green Tea and Chocolate, Lychee, and Raspberry and Rose…with decorative flourishes of chocolate drizzle, gold and rose petals! 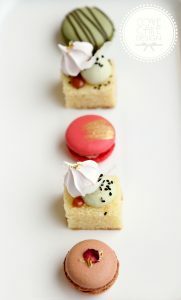 We are always happy to customize flavours to suit your wedding or event….simply contact us with your ideas! Five of our Favourites from 2016! It is hard to believe that another year has passed! We have had a wonderful year of baking and creating cakes and are incredibly grateful for having the opportunity to work with our amazing clients. A big thank you to all who have supported us in 2016 and wishing you all a lovely festive period! For our last post of the year we decided to have a look back at five of our favourite cakes from 2016. 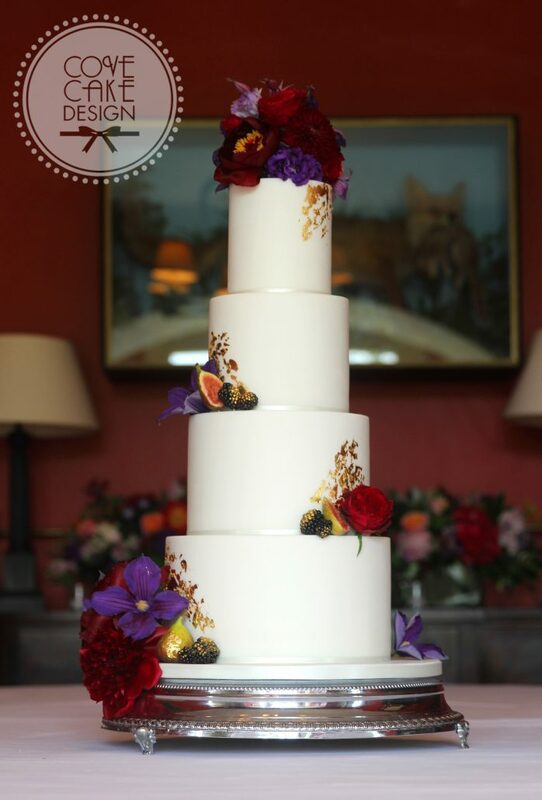 What started as a delicious towering blank canvas became a rich and sumptuous cake with the help of some beautiful deep blooms from Appassionata Flowers, gilded fruits and a splash of gold leaf. Set up in one of Virginia Park Lodge‘s cosy rooms, this cake formed the centrepiece for a delicious evening wedding buffet. Sometimes simplicity speaks for itself. 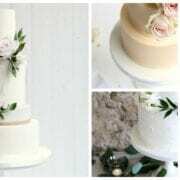 Classic smooth blush buttercream adorned with the most gorgeous of avalanche roses by Unique Flowers became one of our summer wedding favourites! Our client had a wonderful vision for this wedding cake, dark and rich to reflect the wild wintery surroundings of Connemara where the wedding took place. Three tiers of Guinness Chocolate cake coated in chocolate ganache, trimmed with gold leaf and adorned with dark winter fruits. This one begged to be eaten! This cake epitomises the effectiveness of a simple palette, a perfect setting and beautiful styling. A rustic white iced cake adorned with fresh greenery and accompanied by marshmallows and macarons, was surrounded by foliage and soft candlelight. 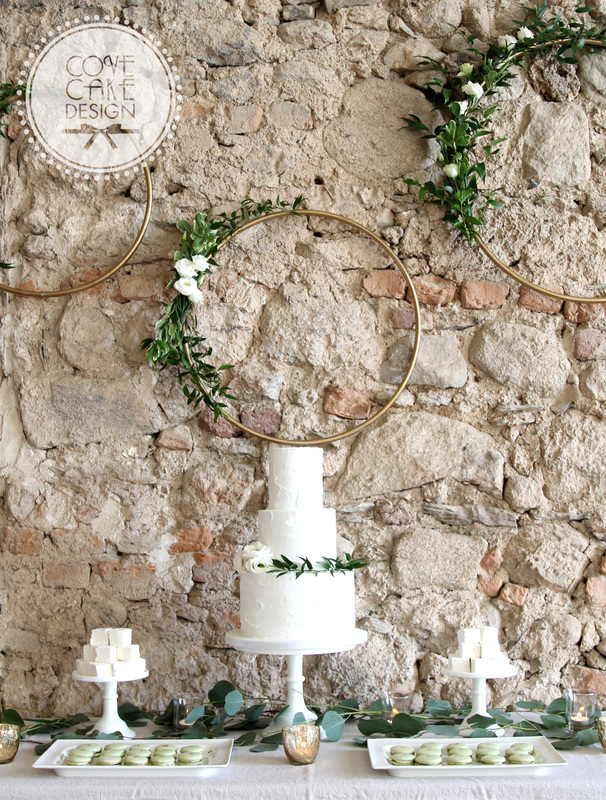 Set against a rustic stone backdrop with those amazing floral hoops by the Wedding Festival, this cake table formed a classically beautiful centrepiece for the wedding reception. I may be displaying a little bias in choosing this one, as this cake was made for my brother-in-law and his beautiful bride who were married in 2016. Designed around the monogram of their wedding invitations, I loved how the floral semi-wreath turned out. And I got to eat some of this one..!!! http://www.covecakedesign.ie/wp-content/uploads/2016/12/2016-collage.jpg 1200 2400 Suzanne Brady http://www.covecakedesign.ie/wp-content/uploads/2019/04/Cove_web.png Suzanne Brady2016-12-23 20:30:262017-03-13 21:16:45Five of our Favourites from 2016! Having always been a fan of the chic Irish fashion and lifestyle magazine, Image, it is no surprise that it’s sister magazine, Image Brides, has become my go-to read for following trends and finding inspiration in the wedding industry. It was hence a delight to have been invited to design a cake for an editorial in their current Winter/Spring edition. 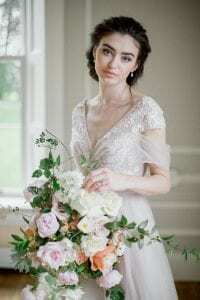 The shoot took place at one of Ireland’s most exclusive wedding venues, Clonwilliam House, a gorgeous country house set amongst wooded hills in the Vale of Avoca in Co. Wicklow. Meticulously renovated and decorated, Clonwilliam exudes contemporary glamour in stunning period surroundings…I had serious house envy! (Image courtesy of One Fab Day). 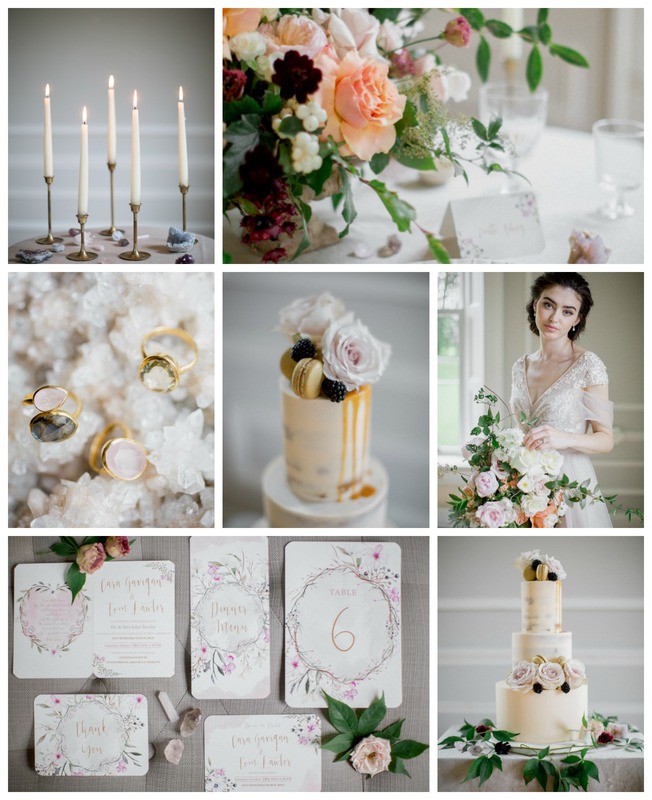 The theme of the shoot was ‘Alchemy’, with styling by Ciara O’Halloran of Style Serendipity, who specialises in beautiful wedding, interior and food styling. 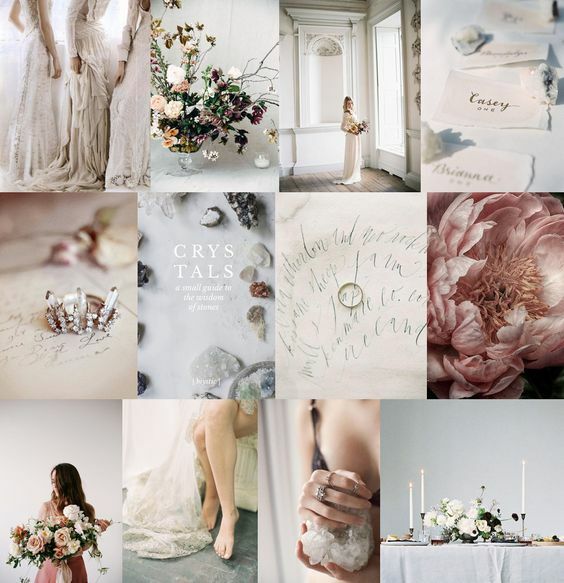 Her brief and mood board were tantalising. 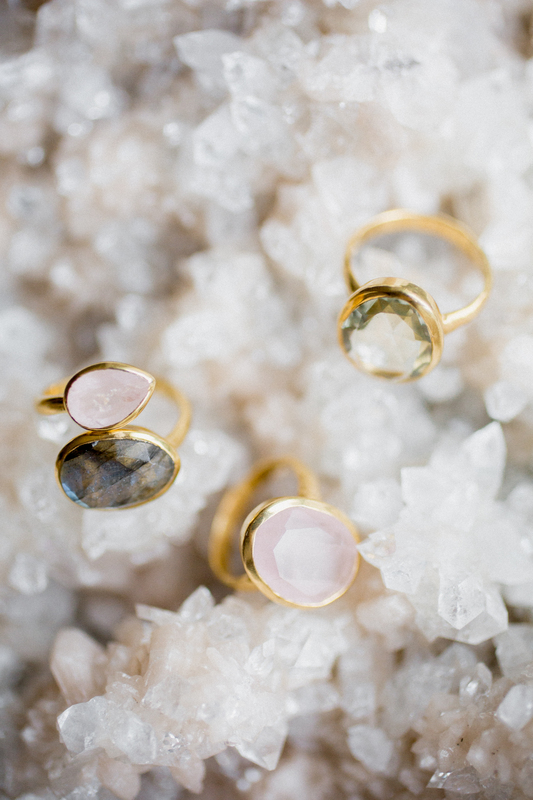 With inspiration taken from the earthy magic of crystal and mineral stones, the look was about capturing the simplicity and beauty of natural elements, with delicate jewellery , large blooming flowers and bohemian gowns in shades of ‘rose quartz, rich cream, shimmering gold and crystal grey’ creating an ‘effortlessly luxe’, romantic, mysterious and enchanting mood. The photographer for the shoot was the talented Christina of Brosnan Photographic. Having admired her light, relaxed photography for some time I was thrilled to finally get the opportunity to work with her. It was a delight to watch Ciara and Christina at work throughout the morning and the final photos from the shoot were undoubtedly stunning!…. 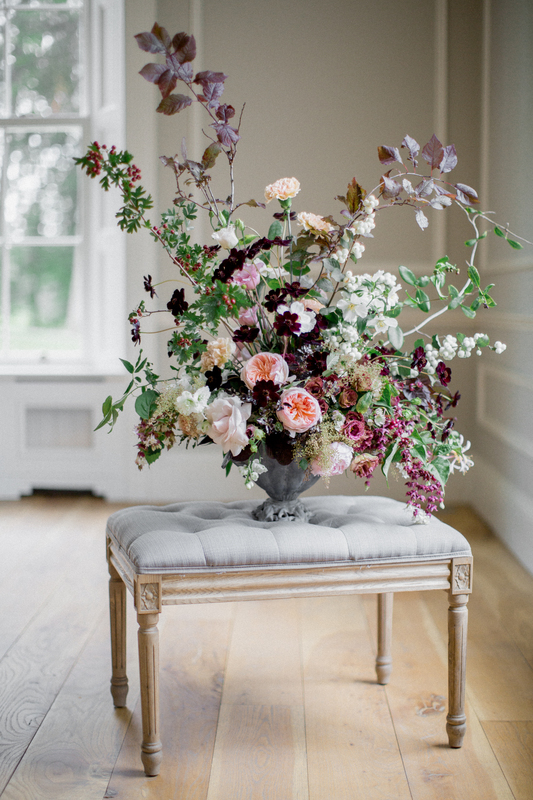 Love the colours and relaxed style of this flower arrangement by The French Touch! 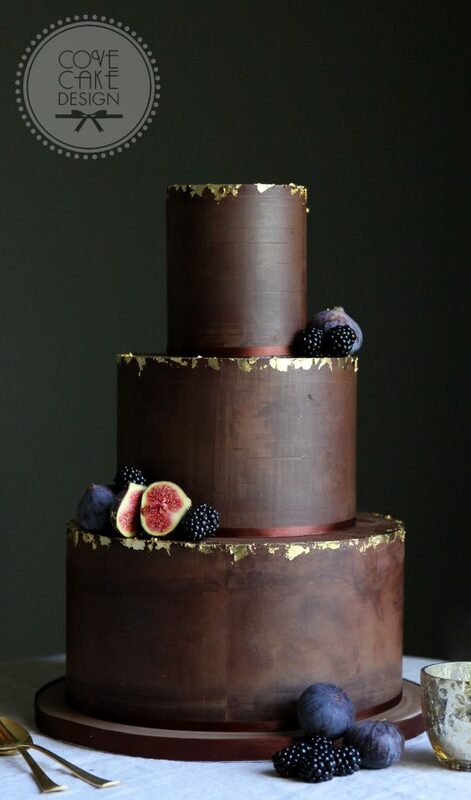 And for the cake….Ciara briefed on a ‘luxe bohemian’ style, suggesting dripping caramel, fruits and blooms with additional elements such as gold leaf and macarons for added decadence. 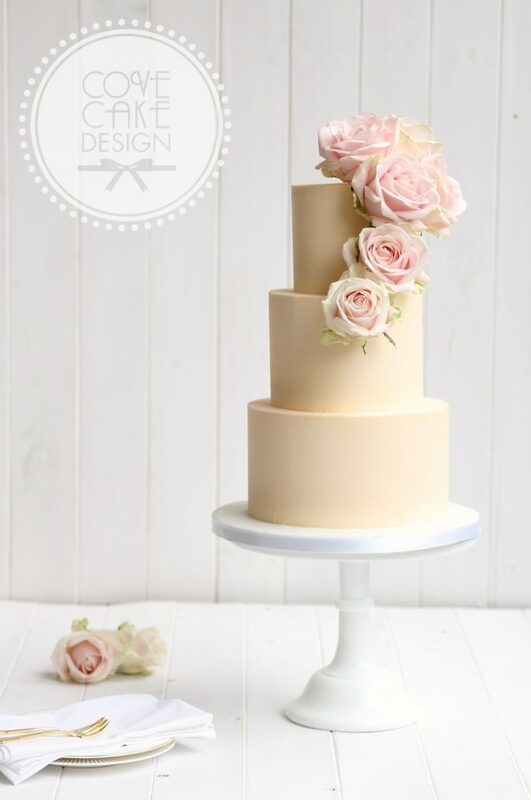 We opted for a natural blush buttercream finish, contrasting a smooth base tier with semi-naked upper tiers. A luscious caramel drip was complimented with simple yet elegant styling: gorgeous roses by The French Touch Flowers offset by contrasting blackberries..and of course those gold macarons for some luxury! It is always nice to see the different elements of the shoot come together and I think all credit to a great team who created this contemporary, romantic luxe beauty! See more of this shoot and indeed lots more inspiration, supplier guides and real weddings in the gorgeous Winter/Spring edition of Image Brides, on shelves now! I am a bit of a hoarder of cookbooks, finding it difficult to pass by the aisle in the bookshop. My mantra is you can never have too many, and since the start of my cake business I have now amassed cake books in equal measure to my general cooking books. I am particularly drawn to those that have something a little bit different, be it in style or in particular, flavours. I discovered Henrietta Inman through her Instagram account, which showcases her cakes and desserts decorated in a colourful array of pretty flowers and berries. All of her cakes and bakes are made free from wheat, dairy and refined sugar. Her book ‘Clean Cakes’ was released earlier this year and while the name initially held me back (I don’t believe in classifying food as ‘clean’ or otherwise! 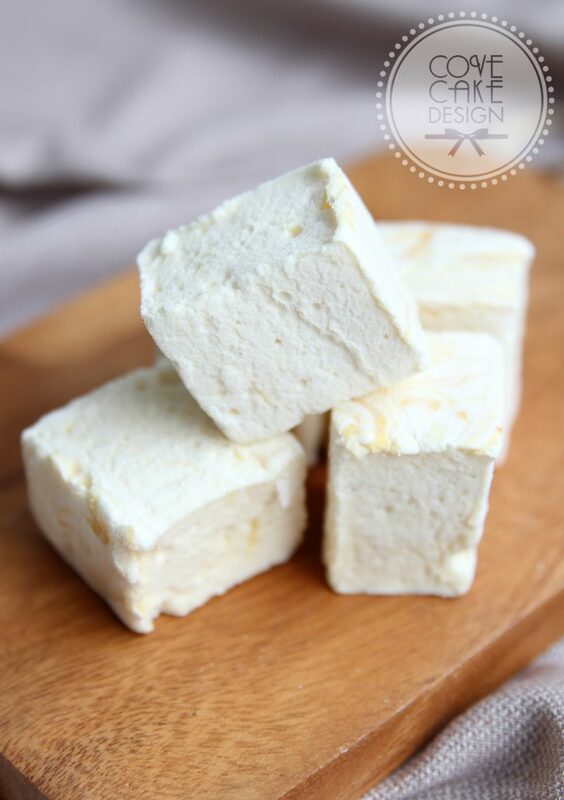 ), the delicious flavour combinations showcased on her blog left me too tempted! The book gives an excellent introduction into alternative ingredients to make your bakes ‘free-from’ and is subsequently divided into chapters on cakes; muffins, loaves and breads; biscuits, brownies and bars; tarts and pies; raw desserts; and finally, chocolates and little treats. I was most tempted by the Courgette, Basil, Lime and Pistachio Cake with Avocado Lime Cream and Raspberry Jam. Yes, you did read all those ingredients together! It was an unusual combination which I tested on some dinner party guests. Although the recipe denotes making layers I made a single larger cake for simplicity. Made with coconut flour and sugar, the cake was deliciously moist and incredibly nutty from the ground pistachio. The icing was a combination of avocado, lime juice, coconut yogurt and coconut sugar. Underneath the icing was a layer of raspberry jam. This was an unusual addition I thought, but actually added an amazing dimension to the final flavour. To say the cake tasted divine was an understatement…it got a resounding thumbs up from my dinner party guests and the flavours and ingredients became a lovely talking point too! Other recipes in the book which caught my eye were the savoury Roasted Root Vegetable Tarts with Spiced Sesame Crust, Purple Haze Loaf with Super-Berry Cashew Yogurt, and the Chocolate Hazelnut Torte with Honey Praline Ganache. I did find that some recipes in the book had ingredients that were not readily available (despite me living in a capital city well-served by delis and speciality shops). Items such as palmyra nectar (which I had never heard of before!) and teff flour were not available in my local health food shop. However I did substitute honey for the coconut sugar in the icing of the Courgette cake and I imagine other simple substitutions are also possible. For a baker interested in free-from cakes and treats and who likes to source and experiment with different ingredients I would highly recommend this book! 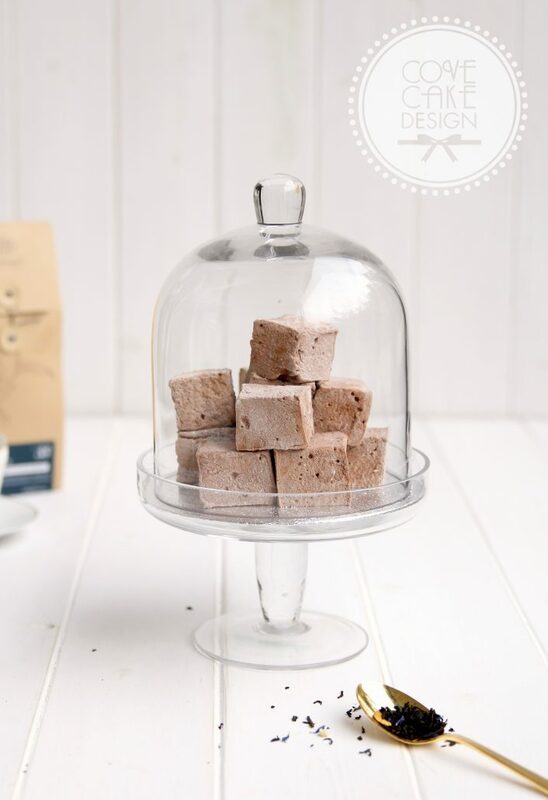 Deliciously light and fluffy, and with endless flavour possibilities, homemade marshmallows make perfect additions to a wedding cake table as well as beautiful guest favours. We have been having some fun experimenting with flavours and are delighted to share some of our favourites. With so many options we would as always be delighted to customise flavours as required! Our favourite flavours which taste so good independently or combined. We couldn’t decide which to choose so will leave it up to you! 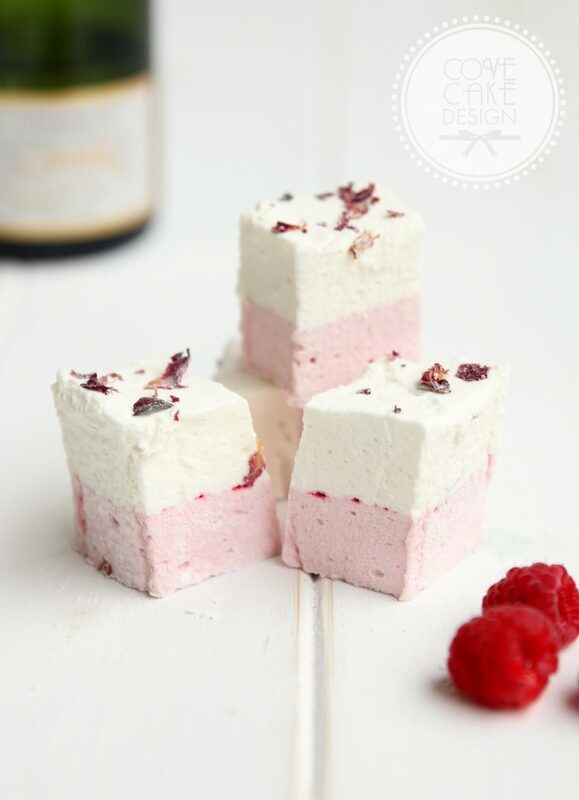 Here we have layered fresh raspberry and rose with deliciously decadent real champagne mallow. Flecks of freeze-dried raspberry between the layers add a little surprise! 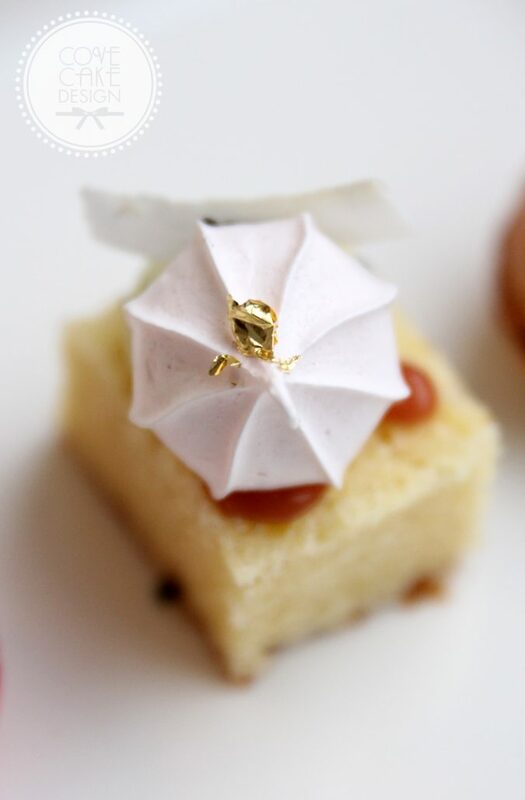 Sweet and caramel-like, our roasted Belgian white chocolate is delicious swirled through vanilla bean marshmallow. 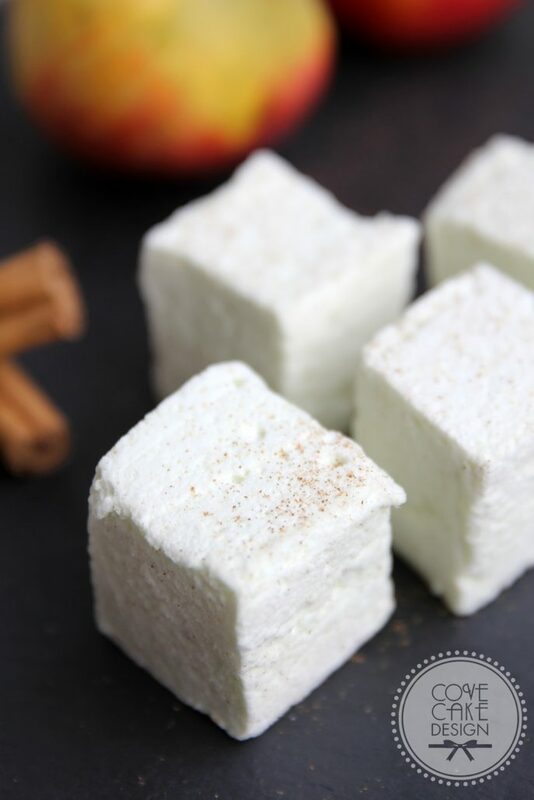 Made with pure local Irish apple juice, this lightly spiced marshmallow is a real taste of Autumn. 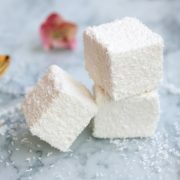 Fragrant Malibu marshmallow coated in textural dessicated coconut. 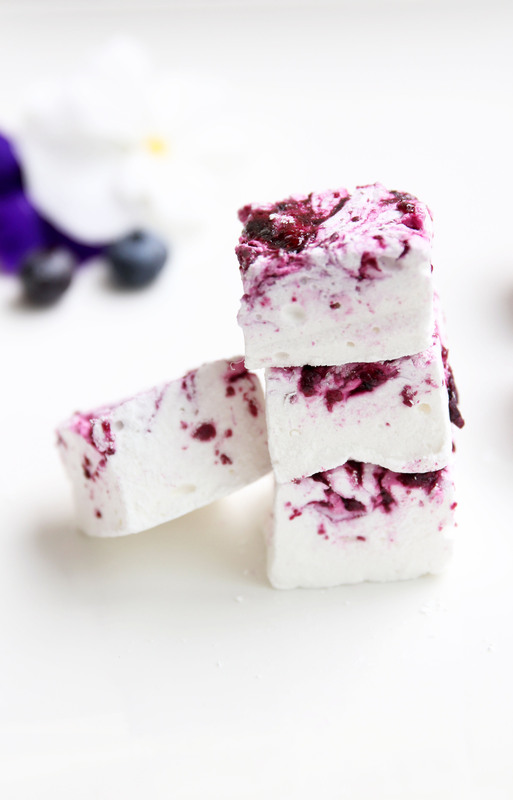 Visually beautiful and equally delicious, this blueberry swirl marshmallow can also be made with other summer fruits. It is always a delight when a finished wedding cake display exceeds all of your expectations. Such was the case for a recent cake table we styled in the gorgeous garden room of Powerscourt House. 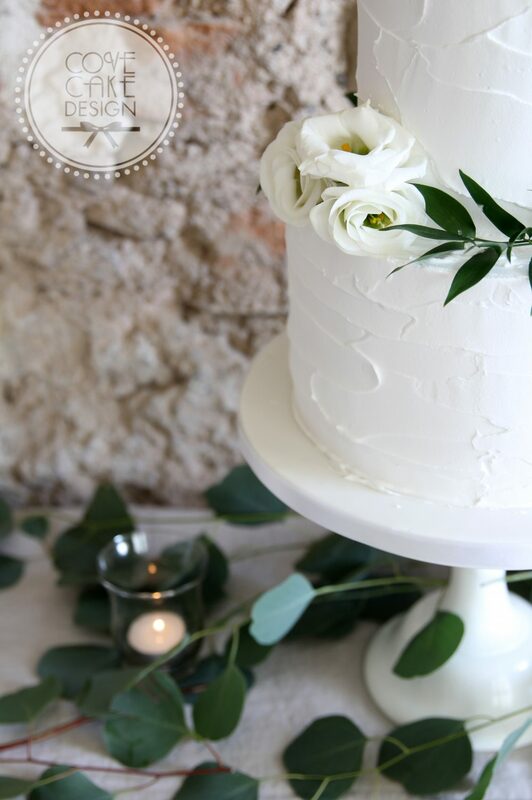 Our client had a beautiful vision for her cake and the finished display exemplifies how a little thought and some simple yet considered styling can really give your wedding cake the wow factor. Our client chose a simple textured white iced cake adorned with fresh greenery and lisianthus, in keeping with the green and white scheme of the gorgoues wedding flowers by The French Touch. Delicious cake flavours of Guinness Chocolate with Caramelised White Chocolate, and Lime White Chocolate and Pistachio were accompanied by fluffy Coconut Marshmallow and Pistachio Macarons. With a stone wall backdrop and flooded with natural light from the grand windows overlooking Powerscourt Gardens, the garden room was the perfect spot to create a stunning wedding cake centrepiece. 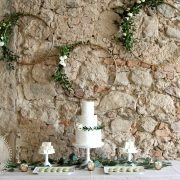 A natural stone-coloured linen tablecloth complemented the rustic stone walls. Cakes and treats were displayed on pristine white stands and plates, surrounded by natural greenery interspersed with hurricane and antique votives. The final flourish was the floral gold hoops by wedding planners The Wedding Festival. I had no idea these were part of the display until I arrived, and oh my they were just fabulous! 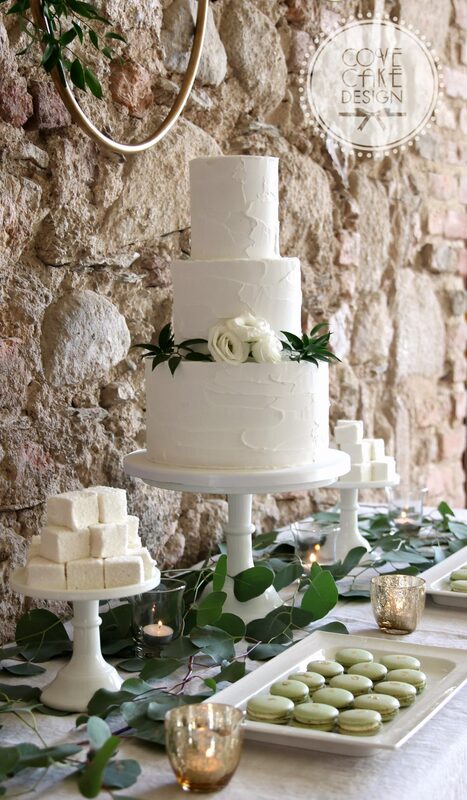 Props used in this table styling and more are available to hire from Cove Cake Design. 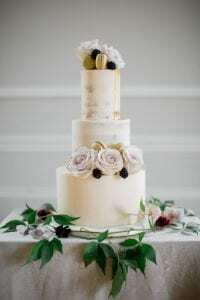 Contact us to discuss your wedding cake styling! 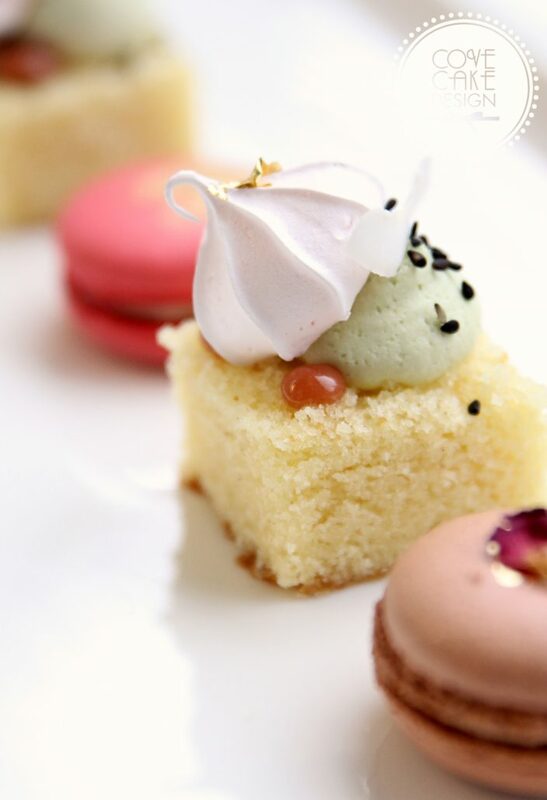 With the unsurprising popularity of macarons as wedding favours or pretty additions to cake tables, we are delighted to launch our first macaron menu.